Ideally situated close to all the central amenities in Pretoria, easily accessible from all major routes in Gauteng and very competitively priced is Pretoria's very own dedicated International Convention Centre. 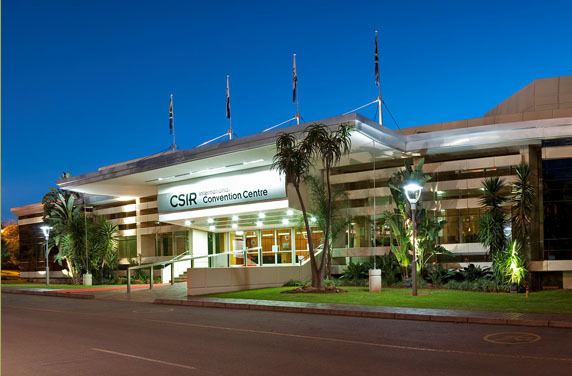 The CSIR International Convention Centre offers superb facilities and quality service with conference, function and exhibition venues that can accommodate events of 500 to as little as 10 delegates and guests, with groups as large as 1000 being accommodated at times. Flexibility, service excellence and professionalism are key to what the International Convention Centre offers its clients. The Centre also offers a modern one-stop business centre with related support services, facilities for the physically disabled, glass-fronted soundproof translation and press booths, on-site medical assistance and security and free secure parking. Banking facilities, travel desks and bureau de change can be arranged on request and interpreting, documentation, conference organising and other services are available through the Centre's network of excellent partnerships. State-of-the-art audiovisual equipment together with an infrastructure that supports videoconferencing, all other communication systems such as satellite links and specialized power requirements gives the Centre an added edge that enhances and supports any event. All the Centre's equipment and facilities are constantly upgraded to ensure that it continues to be competitive on international standards. Not only does this Centre provide the perfect venue, it also boasts a highly experienced team that will conceptualise and arrange special events and special services such as overnight accommodation, transport, laser shows, theme evenings and custom-made décor with professional and creative flair. The Centre is the location chosen for over 500 diverse workshops, meetings, conferences, congresses, conventions and exhibitions with accompanying functions each year. Some of these include the Africa Conference on Elections, Democracy and Governance; the TRC Hearings; the Simmentaler World Congress; WSSD: Science at the Summit; Visit by Yassar Arafat; the Bionet International Global Congress and the Seventh International Fiqh Conference, which included halaal catering for 500 delegates. The experienced team of chefs at the Centre offers great menus with a distinctive flair. Gastronomical delights abound from pastries to buffets and plated meals, cocktail fare, barbeque functions and gala banquets. Religious and medical dietary requirements are catered for with ease and the Centre's Executive Chef takes great pleasure in creating personalised menus to suit each individual clients requirements. The Centre prides itself on its competitive pricing and its ability to adapt to individual needs. The CSIR International Convention Centre has a programme in place to train people from previously disadvantaged communities in skills required for employment in the catering industry. Many of the trained individuals are then employed by the CSIR on a full-time or part-time basis, or they apply for jobs elsewhere using their newly acquired skills. Another arm of the Centre's community service is the donation of food or consumables that are not used during an event to charities in and around Pretoria. These donations are made on a regular basis on behalf of the event host, who is credited by name for the contribution.